Goleta’s original grid is now home to some of the area’s most coveted restaurants, bars, and quick bites, and this itinerary takes you to many of them in Goleta’s Old Town. So, what makes it Old Town? Well, like many California towns, Goleta sprung up around the railroad, which transported much of the area’s rich agricultural bounty to towns and cities throughout the state and beyond. Today, this area remains one of our favorite go-tos and the heart of the city with an established feel and some excellent eats. If you want to catch some of the area’s best upcoming musicians, make a visit to Mercury Lounge. This favorite neighborhood bar is known for booking the best local and touring talent around. “The Merc” does offer a loung-y feel, but with a fun, modern infusion that makes it a must for anyone seeking some nightlife. The party continues at The Imperial. A vintage vibe and fun beach décor welcome you in, while the thoughtfully crafted cocktails invite you to stay. Music ranges from classic jazz tunes to some of the newest contemporary sounds. Head on over and choose from cocktail fusions like the Mai Chai, Tiki Mary, and Green Flash. Goleta Sushi House is known for its plentiful servings, hearty rolls, and friendly service, where the owner often greets patrons. You can find traditional rolls and plates (consider starting with a heaping serving of yummy seaweed salad! ), as well as some more contemporary options, such as the Spicy Scallop Roll. If you’re craving sushi, this is a Goleta must you won’t want to miss. Continue sourcing some Old Town ethnic flavors at Noodle City. This Vietnamese restaurant offers fast service and flavorful pho. Also make sure to try the sampler (egg rolls, shrimp rolls, and spring rolls), Thai Iced Tea, and Combo Fried Rice. If you want to get an idea of what was happening in Old Town Goleta circa 1958, you still can when you head to Pepe’s. This classic Mexican food restaurant has been serving up fast favorites for nearly six decades! Choose from soaps and ensaladas, sandwiches, burritos, enchiladas, soft tacos, and especialidades. Couple it all with a drink from the full bar. And then, of course, there’s the Goleta cornerstone, the wafting smell of fresh burgers you just can’t pass up. For a fill of Old Town history (and what has since become a Central California staple), stop by Habit Burger (the original!). This classic burger joint opened its doors in 1969, and continues to make thousands of customers happy today with fresh meat, veggies, sandwiches, and the ever-famous Charburger. Craving some Chinese food? Head to The Red Pepper. 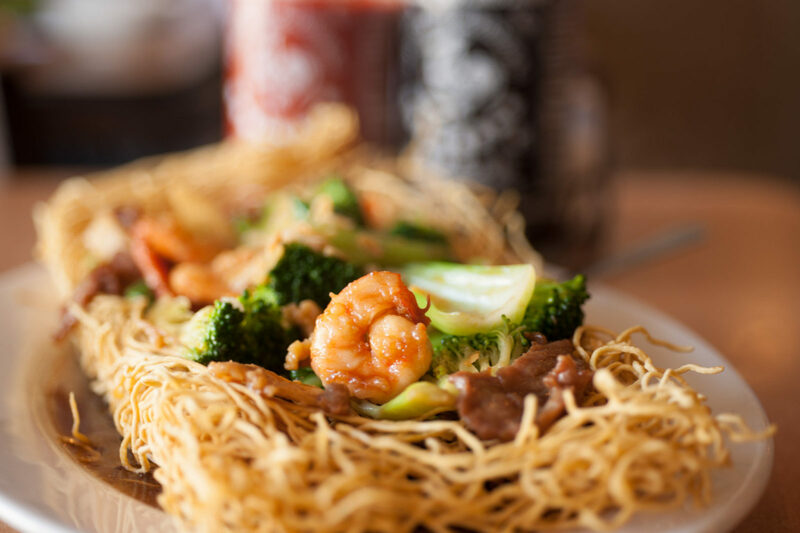 Serving both lunch and dinner, you can get your fill of Chow Mein, Fried Rice, soup, and a variety of pork, chicken, beef, veggie, and shrimp dishes. Make sure to order the Onion Pancake appetizer; it’s a customer favorite. Ever had an Enchilada Omelette? Wondering where you can find some sensational Huevos Rancheros? Domingo’s Cafe is a homestyle diner that offers a welcoming atmosphere where you can enjoy a fun variety of old favorite and unique breakfast and brunch items. May we suggest the Chile Relleno and Eggs? Yes, please. Finally, if you want to make a multi-purpose stop, swing into Santa Barbara Gift Baskets. You’ll find plenty of local goods, fun gift basket ideas, and can order a glass of wine or beer while you’re here!